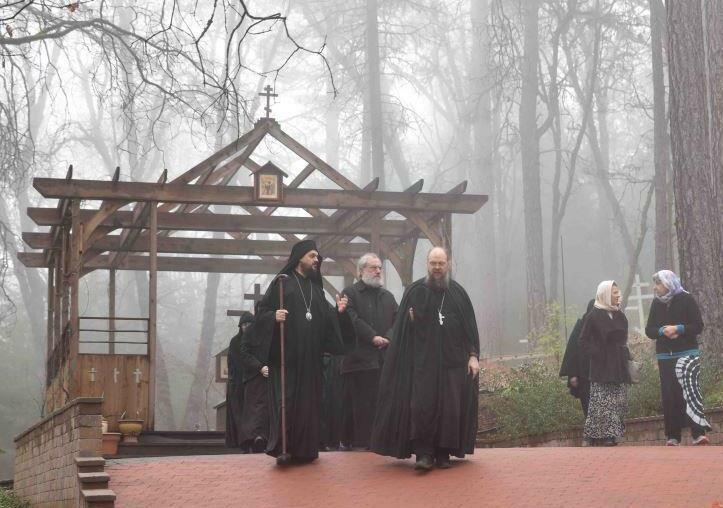 Platin, CA - On Thursday, March 3, 2015, His Grace Bishop Maxim visited the St. Herman of Alaska Monastery in Platina, California, and St. Xenia Skete in nearby Wildwood, together with an honored guest, Protopresbyter Vasileios Thermos of Athens, Greece. This is Fr. Vasileios’ second pilgrimage to the St. Herman Monastery, his first being two years ago, with his presbytera. Fr. Vasileios is a priest of the Church of Greece. Together with his priestly ministry in Athens, he is a practicing psychiatrist, and is Professor of Pastoral Theology and Psychology at the University Ecclesiastical Academy in Athens. The author of many books and articles, he has offered programs and retreats in Greece, the United States, Albania, and Cyprus. On Thursday morning His Grace and Fr. Vasileios were greeted at the monastery gate by the monks, the nuns of St. Xenia Skete, and pilgrims. The Liturgy began at nine o’clock, celebrated by Bishop Maxim, along with Protopresbyter Vasileios, Abbot Damascene, and Hieromonk Paisius. After the Liturgy, Vladika spoke of his gratitude to the brotherhood and to Fr. Vasileios, and of his joy at being at once again celebrating with the monks and nuns the Divine Liturgy. The Liturgy, he said, is the focal point of our existence; in it we experience the whole life of our Lord Jesus Christ. Soon thereafter, His Grace and Fr. Vasileios went to the grave of Hieromonk Seraphim, and were shown the newly finished Resurrection shrine, and works-in-progress: the library/reading room, archontariki (reception room), and adjoining kitchenette. The meal in the trapeza followed, after which Fr. Damascene thanked His Grace and Fr. Vasileios for blessing the monastery with their visit, and providing everyone present with spiritual inspiration and nourishment on the eve of the Great Fast. After the talk, Fr. Vasileios answered many questions from the monks, nuns, and pilgrims on a wide range of subjects—mostly concerning the spiritual life, illnesses of the soul, and the struggle with thoughts. Fr. Vasileios’ answers exhibited both practical knowledge and warm compassion, borne of his many years of caring for souls. Bishop Maxim and Fr. Vasileios, along with the hieromonks of St. Herman Monastery, then went to visit St. Xenia Skete. After Abbess Dorothea gave a tour of the Skete to Fr. Vasileios, everyone sat down to tea, where Fr. Vasileios offered more soul-profiting words. His Grace and Fr. Vasileios concluded the gathering by singing, in the original Greek, the Lenten hymn, “Open to Me the Doors of Repentance,” in anticipation of the coming Fast. This hymn, Vladika said, has been described as encapsulating the greatest glory of Byzantium. The visit of Bishop Maxim and Fr. Vasileios left joy in the hearts of all, together with practical wisdom with which to grow in the life in Christ. The brothers and sisters were grateful as always to their Vladika for his archpastoral care, and to Fr. Vasileios for sharing his rich experience, and for his friendship.